These jaw-dropping before-and-after photos are by the College of St. Benilde’s graduating interior design class. Check out their socially responsible exhibit here. The practice of interior design is often associated with high-end, fancy spaces for hotels, upscale residences, and the like. That is true, but interior design is also for the enrichment and comfort of the general public, regardless of income or social standing. Because of this, the pioneer interior design graduating batch of the De La Salle-College of St. Benilde (DLS-CSB) launches its graduation project ABaKaDa: Himig + Titik. 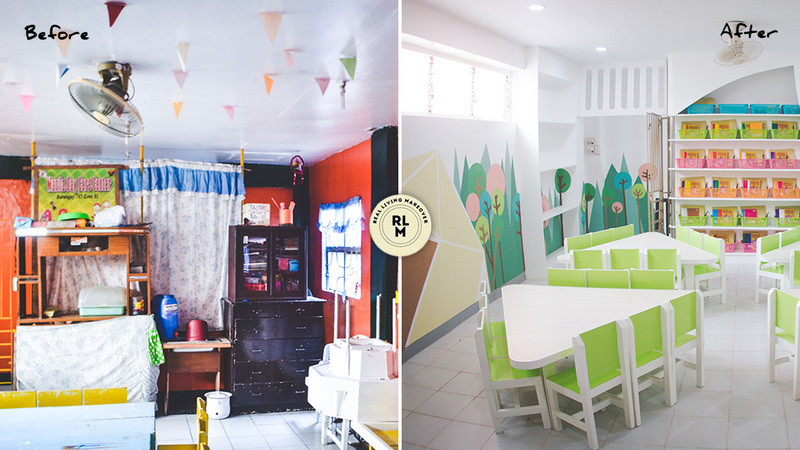 In this project, the interior design students partnered with CSB’s Center for Social Action to renovate four different daycare centers in Manila. The chosen barangays coordinated with the students in upgrading their daycare facilities using traditional Filipino nursery rhymes as design inspiration.